Only one person wanted to end a drought during a week when many in the twin tiers experienced high water, flood damage, closed roads, and overall nasty weather. 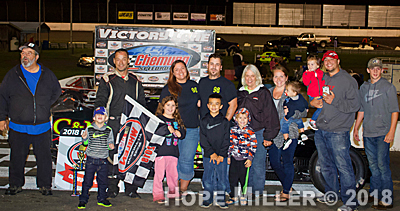 That one person was Charlie Sharpsteen, who was hoping to end an eight-year winless streak at the Speedrome in the headline Sunoco Modified division. He got his wish, despite three delays for a nagging misty rain. Other winners included Nick Robinson (Super Stocks), Triston Kline (4 Cylinders), Keith Youngs (INEX Legends) and Garrett Zacharias (Bandoleros). Nagging misty rain resulted in three delays and forced the postponement of the Meet and Greet until this Saturday night. The 40-lap Sunoco Modified feature had a tough time getting started with trouble on the opening lap. A backstretch incident brought Zack Curren, Paul Johnson and TJ Potrzebowski together. All were able to continue following pit stops for service. The second attempt at a start worked, with heat winners Charlie Sharpsteen and Gene Sharpsteen in the front row. Charlie led and quickly pulled away while Gene engaged in a good battle with Kevin Youngs and Connor Sellars. As the field was working lap 17 Johnson spun on the backstretch and gone was Charlie’s substantial lead. He held onto the lead when racing resumed, but the second half of the race had to be more than a little frustrating for him with four more cautions. He was up to his game on the restarts, most of which had Sellars beside him. Youngs slowed with 10 to go due to a steering problem and he was done. While most eyes were on Sharpsteen, many others were on Zack Knowlden who methodically moved up through the field. A lap 33 restart was pivotal in this one. Sellars jumped the start from position two and the rule is you go to the rear if that happens. That brought Knowlden up to second, where he would stay. Sharpsteen held on and scored the popular win despite the cautions and restarts. “I was trying to hold the bottom, to make it as hard as I could for him,” Sharpsteen said of that long battle with Sellars. Sharpsteen believes his last win came in 2010. “I took a few years off and finally got the car figured out. It’s been a long process and it hasn’t been easy for us.” Looking back on his struggles, they learned the car had a bent rear. “We took it to Rick Kluth and he got us in the right direction.” Knowlden was second in the race, followed by Curren, Jody Buckley and Sellars. RJ Zacharias and Nick Robinson won everything offered up in the Super Stock division. Each won his heat and between them they led every lap in the 25-lap feature event. Zacharias led the way early and lucked out when the caution came out just after Robinson passed him for the lead, but the lap was not scored. That would happen again just past the halfway point. While they battled for the lead, Terry Potrzebowski and Frank Chapman ran together for most of the race. Potrzebowski entered the race just two points ahead of Chapman as both try for the track championship. Jim Lamoreaux was also on a tear and moving up through the field. On a lap 14 restart Robinson got around Zacharias and Lamoreaux worked his way around both Potrzebowski and Chapman. Robinson reversed the back luck and winless season he’d experienced at Chemung with his first win of the season at his hometown track. Zacharias was second, Lamoreaux third, then Potrzebowski and Chapman. Robinson hopes things keep rolling. “RJ gave me lots of room. It was straight-up clean, hard racing,” he said from victory lane. Greg Moldt arrived at the track with three feature wins and the 4 Cylinder point lead. Ten seconds into the 20-lap feature he lost much of what he had worked so hard for this year. On the opening lap Sarah Gooch caught the rear of Kevin May which turned Moldt hard into the backstretch wall. All drivers were ok, but things went from bad to worse for Moldt. “The car may well be done for the year,” he said from his pit. Track officials then said he was disqualified for exiting the car before a track official arrived on scene and said it was ok to do so. Two other drivers received that same penalty earlier in the year. When the race resumed it stayed green and was a battle between heat winners Triston Kline and Monica Green. Kline led every lap and had a nice lead over the two-time track champ when lap 20 click off. Kline, second in points upon arrival, left with the point lead. “Sometimes I don’t get the job done but I did tonight,” he told the crowd. It was Kline’s second win this year. Green finished second, followed by Jesse Hurley, RWD winner Kevin May, and Alex Brown. In INEX Legends action Keith Youngs returned for his first race since mid-June. “I took seven weeks off and it’s hard getting back to it,” he said after joining brothers Kyle and Keith as Legends winners this year. If what he did Saturday night was hard, he made it look relatively easy and won both his heat and the 20-lap feature. Youngs dueled early with hear winner Chuck Lohmeyer but he made an inside pass on the eighth lap. With the inside lane opened, Teddy Bowen followed him and took over second while Lohmeyer fell to third. The only caution came when James Anderson spun with six to go. Youngs prevailed on the restart and held off a hard-charging Bowen for the win. “He ran me clean, that was a good race,” he said. Gary Ham and Anderson finished behind Youngs, Bowen and Lohmeyer. Garrett Zacharias and Evan Rygielski won their Bandolero heats and joined each other in victory lane again following the 10-lap feature. The race was slowed by three cautions, and on two of the three restarts Josh Duke and Garrett Zacharias were penalized for firing too early so they moved to the outside of row one. “I kept thinking that I have to get these restarts right. But here we go again,” Zacharias said after winning. Rygielski kept his father busy since a wreck just before they left to run at Charlotte. His parents bought a new car in Charlotte and built it overnight in the hotel parking lot. “Yeah, that was a lot of work, and I have to thank my dad,” Rygielski stated. Seth Zacharias finished the race second, followed by Rygielski, Duke and Chase Sinsabaugh. This Saturday night all five track titles will be decided with features paying double points. In addition to watching the Sunoco Modifieds, Super Stocks, 4 Cylinders, INEX Legends and Bandoleros, fans will go on track during intermission for the twice-postponed final Meet and Greet. Pits open at 4 PM, grandstand gates open and practice gets underway at 5, and racing begins at 6 PM. Admission is $13 for adults, $11 for seniors 65+, $5 for kids 6-12, and free for kids 5 and under. 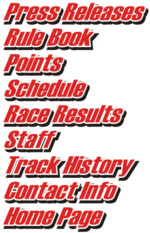 For more information, log on to www.chemungspeedrome.net or “like” us on Facebook (Chemung Speedrome – Racing at the Drome). Chemung Speedrome and NASCAR, Asphalt Racing at its Finest! • Charlie Sharpsteen, Nick Robinson and Triston Kline won free wings from Buffalo Wild Wings in Horseheads as part of their ‘Winner Winner, Chicken Dinner’ bonus program at the track. • Generous race teams and fans brought school supplies for needy children in Elmira. Track announcer Carol Houssock organized the drive, which resulted in a trunk full of supplies and over $100 to purchase more. Special thanks to the unnamed 50/50 winner who donated $65 of his winnings. “I’ve been helped in my life and I want to help others now,” he said.